Epop Web Conferencing is designed to overcome the physical barriers users face when presenting information to co-workers in different physical locations. Epop Web Conferencing remote-control capability streamlines and makes the software training process much more efficient. This sortware provides complete desktop, application, and document sharing, plus audio and video conferencing, implemented entirely in software. E/pop Web Conferencing software offers many improvements over leading industry services. This sortware also feature intuitive permission settings and meeting controls, which can be established and used by the chair of the meeting. Epop software appeals to busy, security-conscious IT staff seeking a superior Web conferencing solution. For video conferencing between internal and external users, This sortware supports SSL/TLS, and even supports using the customers own certificate and/or PKI for the highest level of secure web conferencing available. This sortware offers features that include multi-party audio and synchronous video conferencing, remote control, plus desktop, application/document sharing and dynamic PowerPoint presentation sharing. This sortware does not require server, apart from the operating system and static IP address to trigger up the speed. E/pop web conferencing includes complimentary pre and post sale support and training, assistance with e/pop evaluation plus software installation and deployment. Epop web conferencing is one of the most secure web conferencing solutions available today. Epop Web Conferencing software provides state-of-the art PowerPoint, document, application and desktop sharing, remote control, and multiparty audio and video conferencing. From quick web meetings to full-featured conferences with multiple presenters, Epop makes it fast and easy! Install Server Software in 5 Minutes! WiredRed is pleased to announce a major breakthrough in web and video conferencing: a completely self-contained installation. Epop interactive Web Conferencing software does not have any dependencies nor does it require previously installed web servers, databases, or any other complex server prerequisite. Installation takes 5 minutes. Epop offers true multiparty internet video conferencing as a standard feature, not an add-on. Viewers see smooth, clear, crisp video that works. The implementation is entirely in software, and requires only standard USB video conferencing cameras. The experience rivals hardware-based video conferencing equipment costing tens or hundreds of thousands of dollars. To help you effectively manage bandwidth, you can click on any video display and change the size, quality and frame rate - all in real-time. 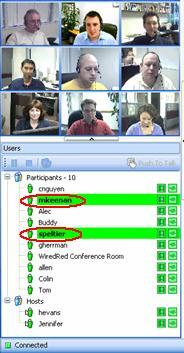 Like its video counterpart above, Epop includes multiparty audio (VoIP) conferencing as a standard feature. The host can enable/disable audio conferencing and easily switch from low-bandwidth, cell phone-like sound to studio quality audio all at the click of a mouse. This is full-duplex, multiparty audio, so any number of users can talk at the same time, though we don’t claim that is very productive! You get better quality audio than a standard phone bridge, with zero degradation with more participants. In addition to video, you can see who’s talking via live participant list (video and participant list are at host’s option). This can be very useful, we have many customers using Epop for VoIP conferencing alone. If your application involves multi-office meetings, training or internal presentations, Epop can significantly reduce your teleconferencing expenses..
Real-Time PowerPoint Sharing: No Pre-Meeting Uploads Required! You don’t need to pre-process or stage your PowerPoint presentations before your meetings. e/pop lets you share any PowerPoint anytime. Your presentation is processed on-the-fly. Epop displays the native rich-text file, not a grainy screen-grab. Text appears nice and clean, even when zooming in and out, and slide transitions appear as they should. Most importantly, since the file is cached at each participant, only page change commands go over the net, so your slide changes are instant. e/pop's web conferencing solution includes desktop sharing and PC remote control at no extra charge. Several factors combine to make Epop the fastest proxy-friendly desktop sharing on the market: 1) the desktop change detect/compression engine has been highly optimized over the years; 2) the client and server software is symmetric multiprocessing enabled; and 3) the server is often located on the customer’s premises, putting most of the “route” on a high-speed LAN. Since all traffic is routed via your conferencing server, e/pop can provide firewall-friendly remote assistance and support for far-away offices, customers and business partners. FAST, No hassle Internet Web Conferencing That Displays Your Logo! You and your presenters simply point your browser at your own web conference server and immediately start your conference. No registration hassles and no 3rd party URLs and advertising displayed in front of your participants. Many IT administrators take the extra step and register their conference server with their DNS. Their employees type simple URLs like conference.mycompany.com to get started, making e/pop the ideal web conferencing company solution. 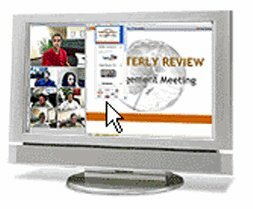 As the presenter, you have fully interactive web conferencing controls at your disposal. You can easily allow/disable participant look-ahead (PowerPoint and documents), promote a participant to presenter, demote presenters, and expel users, all at the click of a mouse. The user interface behaves as you would expect any office application. Just right-click on any user to get a short list of properties and settings you can easily change. It's easy to record your conference, just select the Conference pull-down menu and select record. You can just pick the defaults and record a session for somebody who cannot attend, or select any number of industry standard file formats to get the most our of your existing editing suite and production playback tools. Unlike competitors, e/pop does not lock you in, you can use the recording file format that best fits your needs. The e/pop Web Conferencing Server features a web-based administrative console, making it dramatically easier for administrators to access, control and manage their conference server. The console is easy to use, with clear headings for conference controls, system and user accounts (access rights). The latter features role-based security, you can use names and passwords by user, department or company. Epop web conferencing is one of the most secure web conferencing solutions available today. It is installed software, so you have control over physical security, web conference routing, and access to server event logs. At the click of a mouse, you can set your conference server to always use SSL3/TLS or let your conference hosts decide whether they want to use secure connections. For sensitive applications, you can also set your conference server to use your own public key infrastructure (PKI). No complicated installations, add-ons and overcharges? Epop is available as on-premise software and hosted service, whatever is best for you. Either way, you get easy installation/hosted service activation, all features, and fixed-price, unlimited minutes. No complex billing arrangements. Included in e/pop pricing is all software, updates, server and hosting (hosted service plans), live user training, and unlimited hotline support.